We left our house at about 11. We stopped for lunch at a rest area and then another break at about three o’clock. 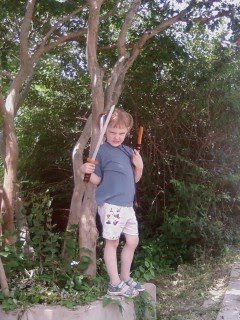 Kyongju at 5! We decided that there would be lots of places to stay near the bus terminal. Most were ‘love hotels’ – too tacky or too expensive! We found the Hanjin Hostel on the fourth try. Mr. Kwon was very friendly. Dinner at “6Shi” near the hostel: Mom had twegi kalbi, Dad had duenjang, and Katherine had gyeran-bap! Then we went back to our hostel and rested. The next morning Daddy and Katherine went for a walk and had a snack at Paris Baguette. Mom woke up around 9 and we drove to McDonald’s for breakfast. Then we headed out for a drive. We went to the Korean Folkcraft Village and wandered around looking at the ceramics. Katherine found a broken pottery bird. We bought an amethyst necklace for Nana and a sword for Katherine! Here is Katherine, Warrior Princess… isn't that an intimidating scowl? Daddy can read Korean very well now; he found a sundubu restaurant for lunch. The walls were yellow and brown clay, with big wooden beams and tree trunks. 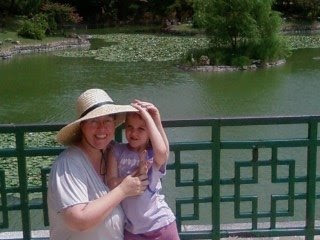 Katherine and Mommy shared the side dishes and some very good haemul pajeon. We kept on driving because we wanted to look around “KyonguLand”. There was a lovely waterfall and pond with fish. Katherine fed the fish but then she fell into the pond and got soaked! So we went back to Hanjin Hostel to change and have an afternoon rest. After a break at our hostel, we went out again to the Kyongju Museum. It was hot, so we tried to stay inside. First, Mom told Katherine the story of the Emi-leh Bell. It was sad but interesting. We saw the apsaras (angel-fairies) on the outside of the bell. Then we looked at the tomb guardians. They are twelve different animals from the Korean/Chinese Zodiac. Mommy is a Rooster and Daddy and Katherine are both Monkeys! We went into the main hall and saw lots of things from Anapchi Pond. There was a big, heavy boat that the Korean princesses used. There were lots of roof tiles. Katherine liked the dragon head because it looked like Mushu. Mommy liked the golden jewelry. We looked at some ceramics and drank lots of water. Then we visited the Shilla golden crown. For supper we were going to eat at the Duck/Chicken (samgyetang) restaurant on Mr. Kwon’s map, but Katherine ran out the front door of the hostel and almost got hit by a car. We were all a little shaken and Mom lost her appetite. The samgyetang restaurant wouldn’t serve just one person, so we had a light dinner of apple pies from Paris Baguette instead. Daddy and Katherine got up early, went for a walk and had cookies for breakfast. Mom was up by 8 and made herself and Katherine some bacon and tomato sandwiches up on the roof with her little camp stove. We packed everything up and said goodbye to Mr. Kwon. He wrote Mom’s favorite Korean shijo poem by Hwang Jini in Chinese calligraphy; Mom says that will be her souvenir from the trip. We went back to the museum from 11 to 12 for Katherine’s ‘children’s art class’. Mom and Katherine put together a Chamsongdae observatory puzzle – twice – saw how the Korean kings’ tombs were built, made some tomb guardian rubbings and created our very own monster face roof tile! We had fun. We stopped for a short time at Anapji; it was even hotter than yesterday. Mom took some pictures of the lotus blossoms and the orange flowers in the surrounding fields. We pretended to be Korean princesses, sailing our boat on the pond, catching fish, and playing with the deer. We did see a real heron standing in the pond! Highway 45 took us between two national parks. Daddy chose Worak-san because of the beautiful waterfall marked on the map. We found a ranger stop with a swing, some great mountains and valleys, a tumbling river full of round stones, and some little restaurants and minbak. ‘Let’s stop and paddle,’ said Mom, so we did. 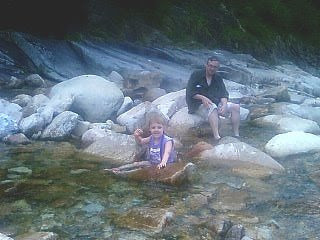 Daddy watched Katherine play in the water while Mom collected some decorative rocks. It was cool and restful. We decided that it was time to get back on the road and had a lovely drive through the rest of the park – but we never did find that waterfall. Let’s go home! Back to Yongin, on the highway. Mom and Katherine fell asleep for a while but they woke up in time for a quick bite of fast food. We unpacked and put everything away, because that’s what you have to do first when you get home! It was good to be back in our own house, and our own beds. posted by Alembyc at 9:22 a.m.